Clever and cunning, the elusive fox lives on every continent in the world except Antarctica. It also lives in a wide variety of terrains –– from forests to grasslands, mountains to deserts to suburban areas. So what else is fascinating about the fox? Scientific name: Vulpes vulpes is the red fox, the largest and most common fox; other species include the the arctic fox, the gray fox, the kit fox and more –– 37 species in all. Family: Foxes are part of the Canidae family, related to wolves, jackals, and dogs. Loners: Foxes are solitary creatures, not pack animals, and live, hunt and sleep alone. The exception to this is when raising their young, foxes live in small families, called leashes or skulks, in underground burrows called dens. Guys and dolls: Female foxes are called vixens; males are called dogs. Diet: Foxes are omnivores; solitary hunters who feed on rabbits, birds, rodents and other small game. Night vision: Vertically oriented pupils, like those of a cat, allow the fox to see in dim light. Life span: Foxes have a fairly short lifespan –– approximately 2-4 years in the wild. About the tail: Like a cat’s tail, the fox’s thick tail aids its balance, but it has other uses as well. 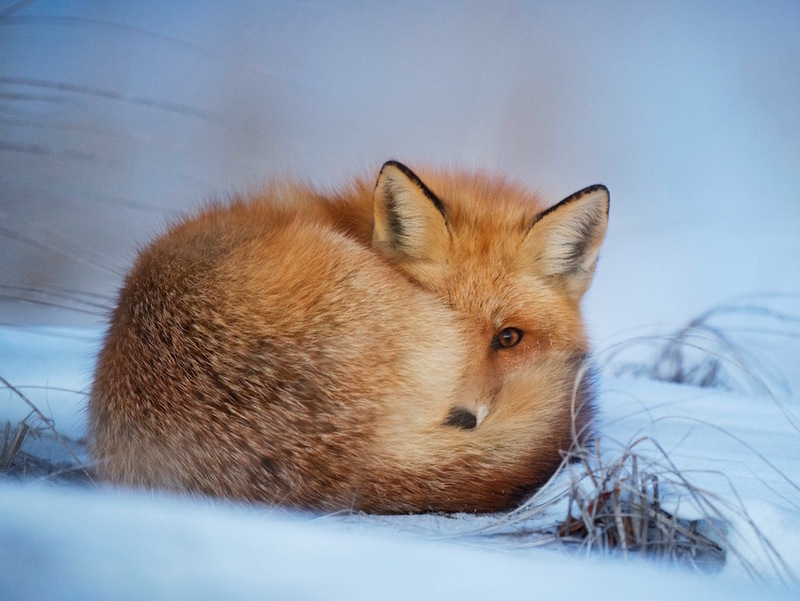 A fox uses its tail (or brush) as a warm cover in cold weather and as a signal flag to communicate with other foxes. And the whiskers: Their whiskers –– located on both their face and legs –– help them to navigate.